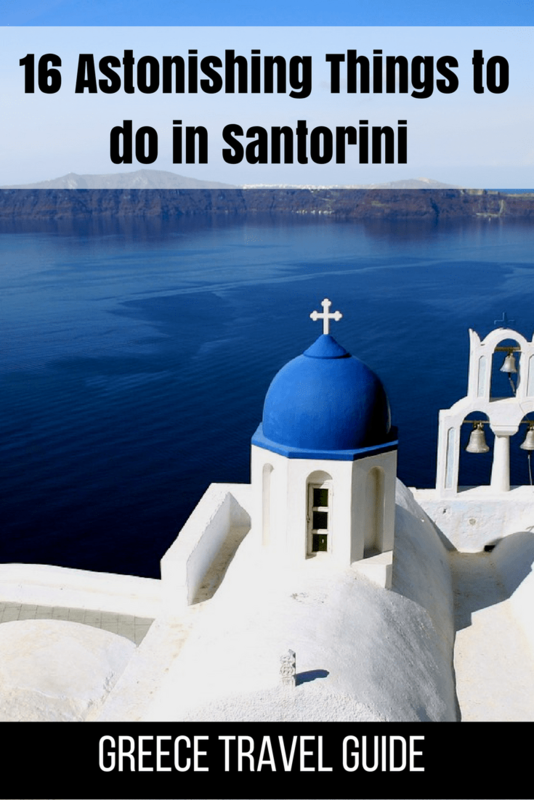 You’ve seen postcard-perfect photos of whitewashed villages with blue domes set against the blue sea – chances are, you were looking at a photo of Santorini, Greece. Santorini is one of the Cyclades islands in the Aegean Sea, and is the remnant of a volcanic caldera, which gives the island a very rugged topography. A 1956 earthquake destroyed many buildings in Santorini, driving many villagers to desert the island. 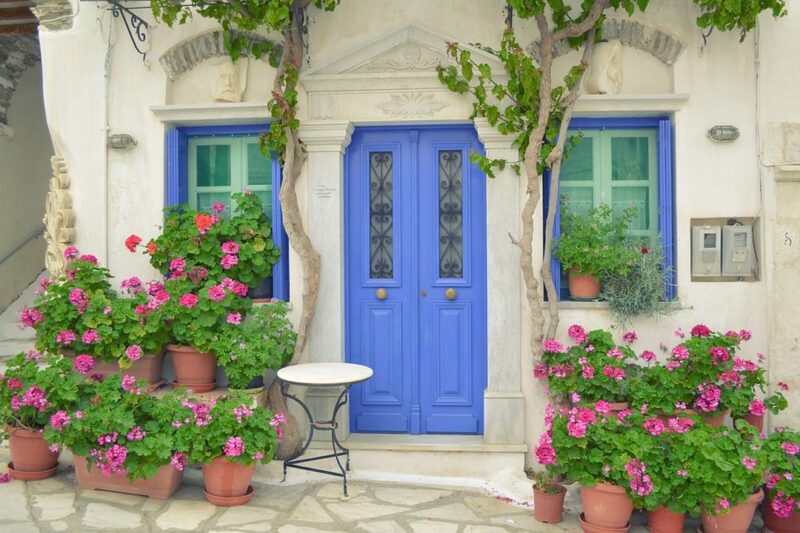 This opened the door for tourism to become the main industry on Santorini. 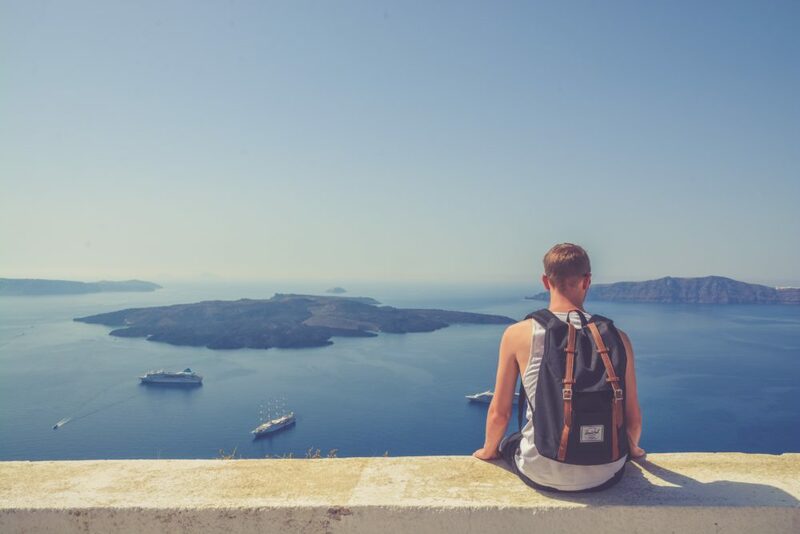 An estimated 2 million visitors come to Santorini each year, and the island frequently tops “best island” lists from publications such as US News, Travel + Leisure and BBC. 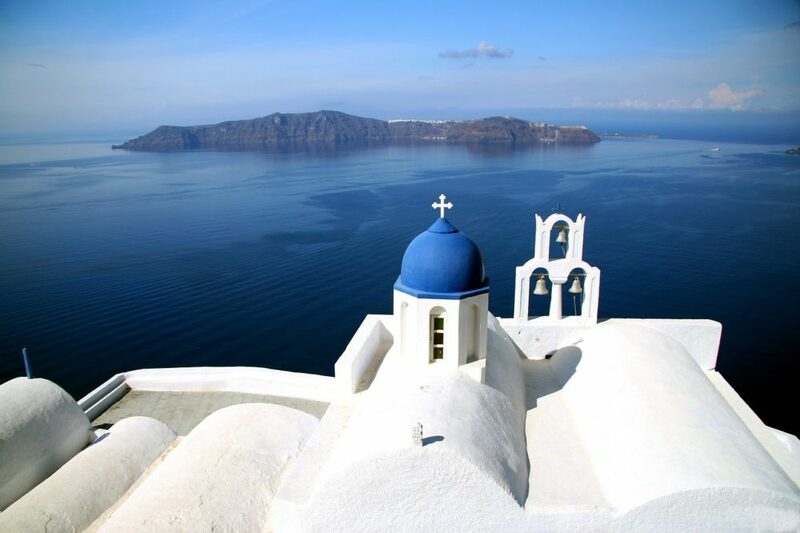 Santorini is among only a few Cyclades islands with a major airport, with several daily flights from Athens. 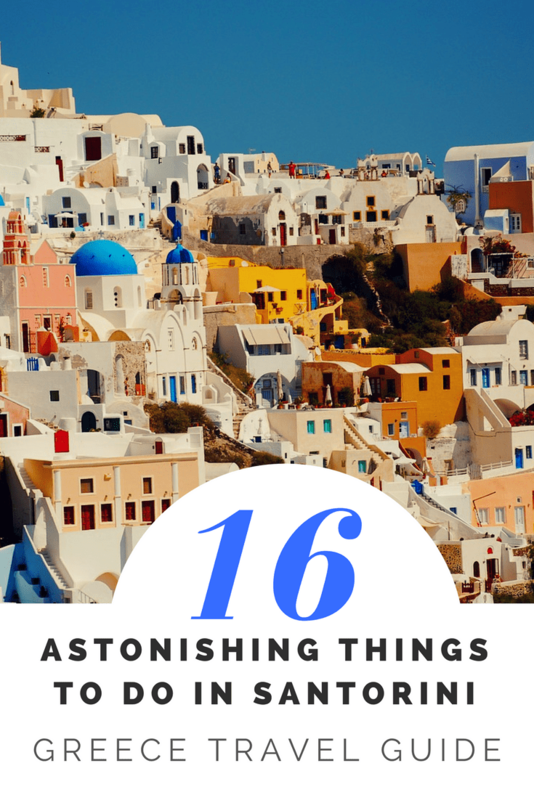 You can also take an 8-hour ferry from Athens to Santorini. Fira (also called Thira or Thera) is the main town on Santorini, and sits on top of a cliff of the caldera. The town is a good base for visitors to Santorini as there are cafes, bars and restaurants, as well as buses to other parts of the island. For necessity or fun, you can take a cable car from the Fira port up to the town of Fira. The cable car is a popular option for cruise ship passengers who arrive at the port and wish to explore other parts of Santorini. 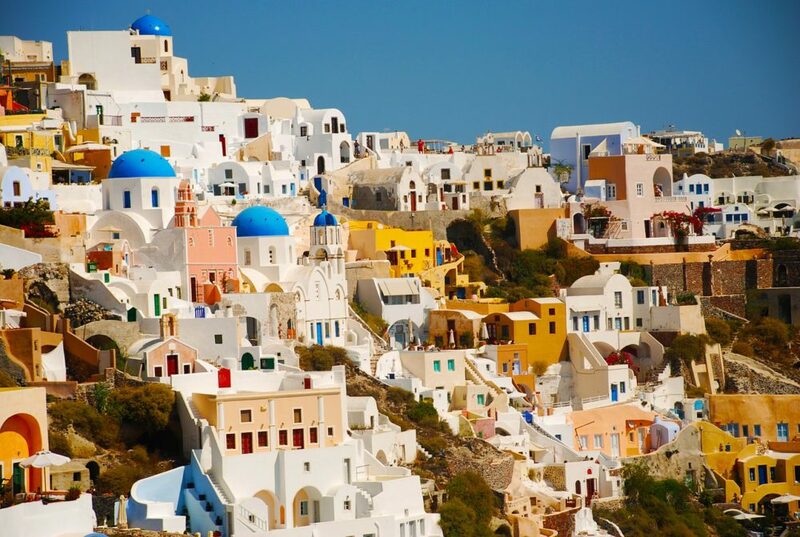 A popular scenic trail on Santorini will lead you from the town of Fira to the port village of Oia. The trail is under 10km and takes between 2 and 4 hours. Most visitors will hike one way, and return via bus. The hike provides excellent views of the volcano, as well as a peek at 4 of the most prominent villages of the island. Oia is home to some of the most picturesque blue-domed buildings, and the Castle of Oia, at the trail’s terminus, is a spectacular place to catch the sunset. Amoudi Bay sits below the village of Oia, and is reached by descending 300 steps. (For those who don’t want to ascend those 300 steps at the end of the day, donkeys are available to hire.) Surrounded by red cliffs and blue water, Amoudi Bay is a destination for cliff diving and sampling the fisherman’s catch of the day at many outdoor tavernas near the water. 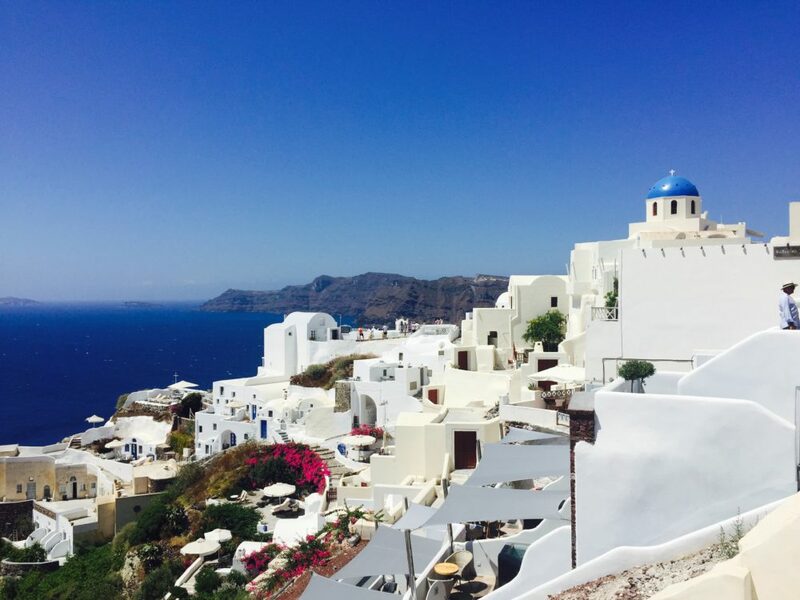 If you are visiting Oia, make sure to save some time for visiting Amoudi Bay. 10km southeast of Fira lies the famous beach resort of Kamari. 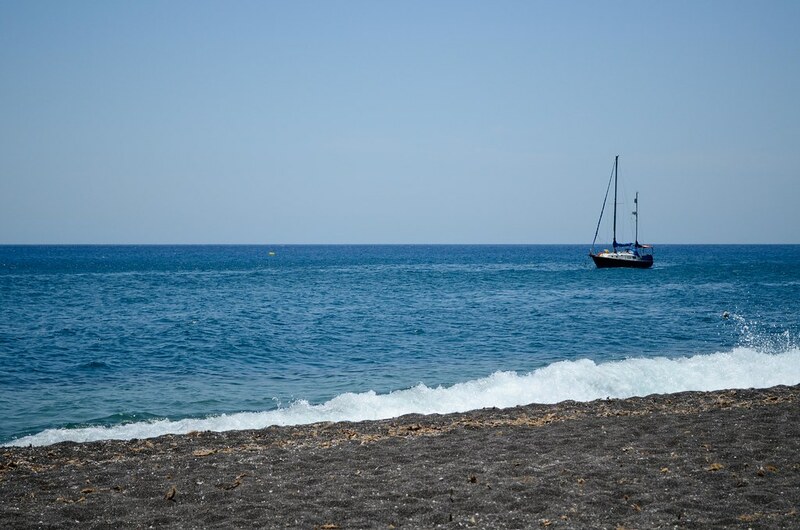 The beach itself if made of volcanic black sand and is very popular for tourists and locals alike. You’ll find plenty of services such as lounge chairs, umbrellas and sports rentals. 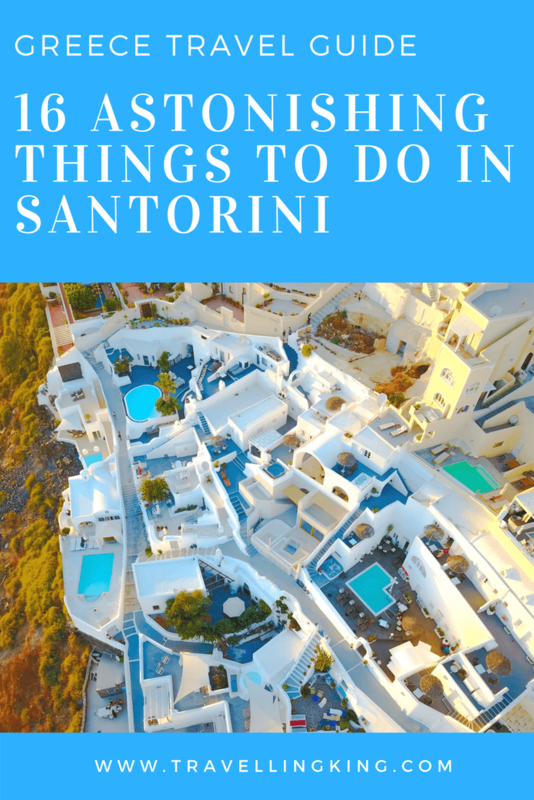 The village of Kamari hosts many hotels, restaurants, cafes, bars and night clubs, so it’s a great place to stay on Santorini. There is an open air movie theater in Kamari Village, with a full bar, which makes for a fun evening out after a day at the beach. 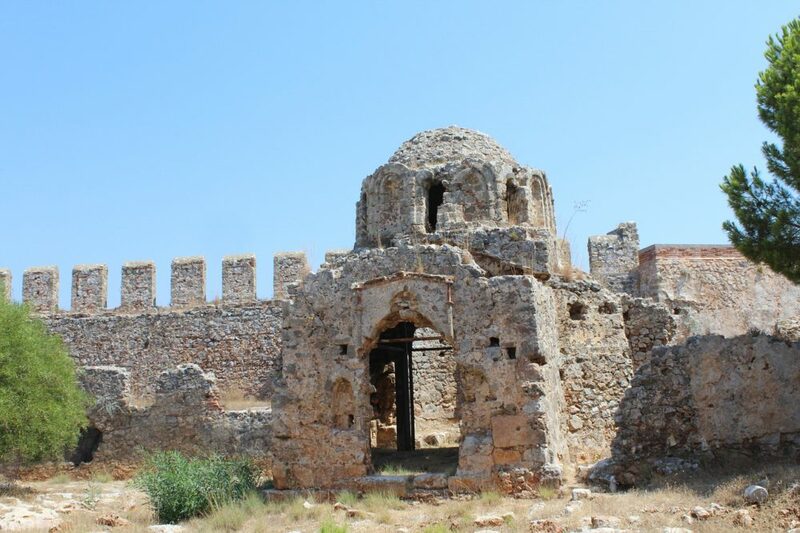 From Kamari, you can drive or join a bus tour, to Ancient Thera, a historic site dating back to the 9th century B.C. Ancient Thera contains Hellenistic, Roman and Byzantine ruins. You’ll see temples, houses, markets, a gymnasium and a theater. Be sure to supplement this visit with a trip to the Museum of Prehistoric Thera, located in Fira. Another ancient settlement you can visit on Santorini is Akrotiri, a settlement from the Minoan Bronze Age that was destroyed in a major eruption in 1627 BC. Still under excavation, visitors to Akrotiri will see original frescoes found on the interior walls of most houses. In the modern-day village of Akrotiri, one of Greece’s oldest lighthouses still stands over the peninsula after 100+ years. Also at Akrotiri is La Ponta, a live music venue housed within a Venetian castle. Visitors to La Ponta can take a guided tour or attend an evening concert during the summer months. 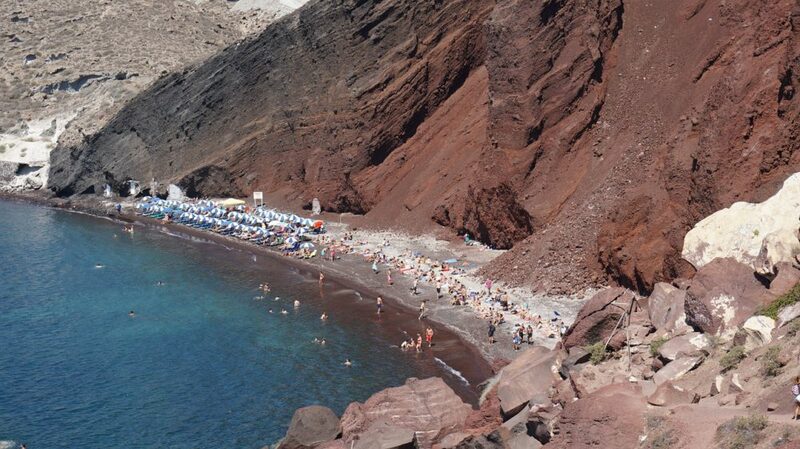 Just beyond the ruins of Akrotiri is the famous Red Beach. Surrounded by towering red cliffs which crumble into red sand, the color contrast of the turquoise waters of the Aegean Sea are a photographer’s dream. 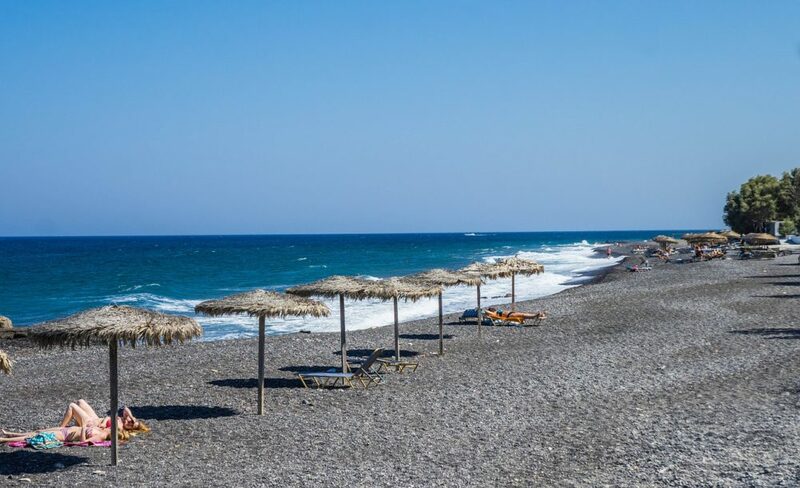 The beach is small, rocky and can be crowded, so there are better beaches on Santorini for a day at the beach, but Red Beach is worth a visit for the scenery. There is also a parking area overlooking Red Beach, which will give you a good aerial view to photograph. The island of Santorini is a major wine-growing region of Greece. 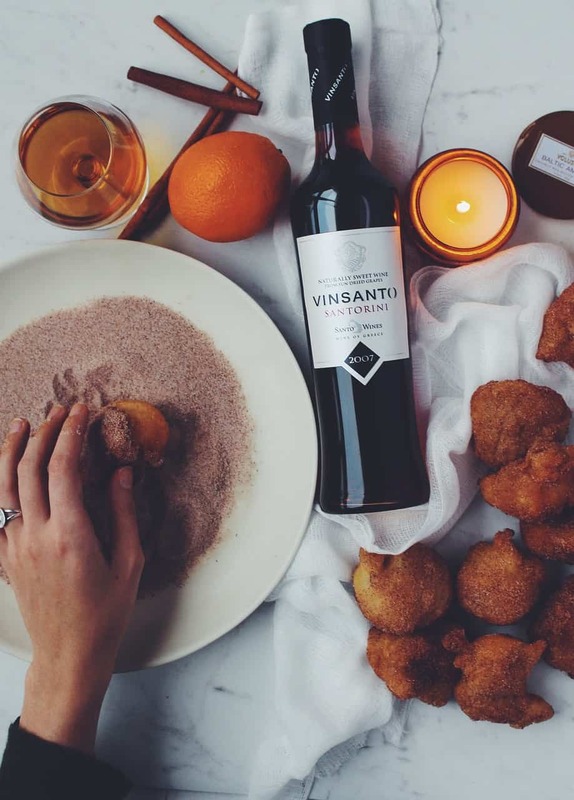 Some say the volcanic soil of the island makes for some of the best wine in the country, and there is evidence of wine growing as far back as 5000 years ago! Assyrtiko is a local white wine that is unique to Santorini. There are dozens of vineyards and tastings room on Santorini and you can create your own driving tour, or join an organized tour and let someone else do the driving. The highest point on Santorini, the village of Pyrgos boasts of panoramic views of the entire island. The village was declared a protected settlement, so the traditional architecture is preserved, with narrow alleys winding through galleries, vineyards, cafes and boutiques. 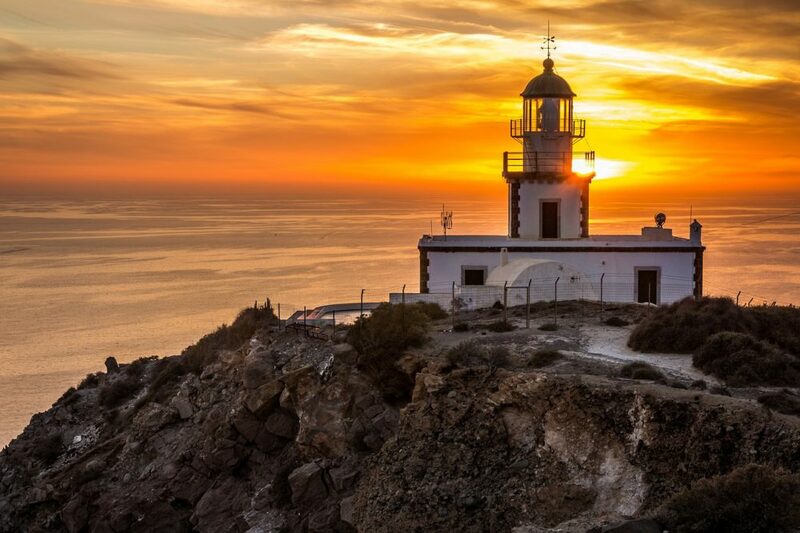 Being at the pinnacle of the island, Pyrgos also offers breathtaking sunset views. A popular day trip for tourists is to visit the volcano and hot springs of Nea Kameni on a tour. From the port of Fira, you can take a boat to the nearby island of Nea Kameni, which is surrounded by warm, sulphuric waters. Nea Kameni is also the site of a still-active volcano, which erupted as recently as the 1950’s. You can follow a trail up the volcano to have a look into the smoldering craters, of which there are several. A popular mode of transportation is by Quad-Bike, or ATV. You can navigate the entire island in a day on a Quad-Bike rental, or join a guided tour if you are more comfortable with that option. 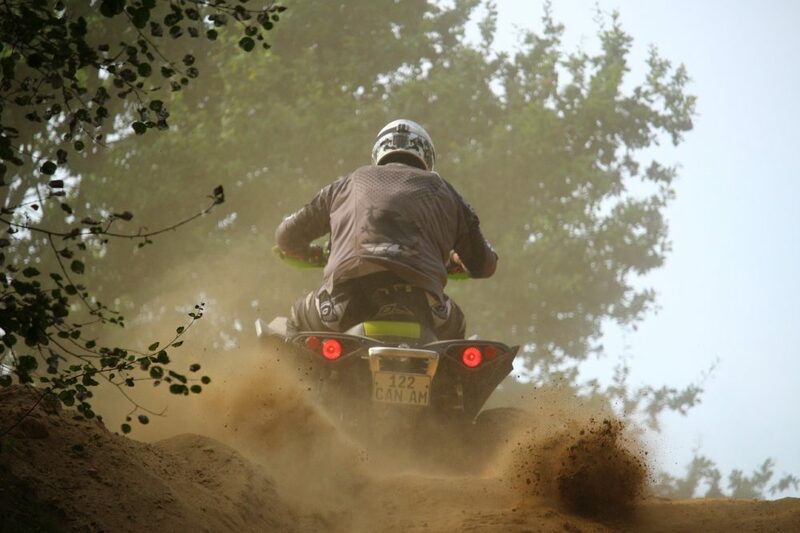 Either way, quad-bikes offer a fun way to explore the island without the headache of car rental and parking issues. 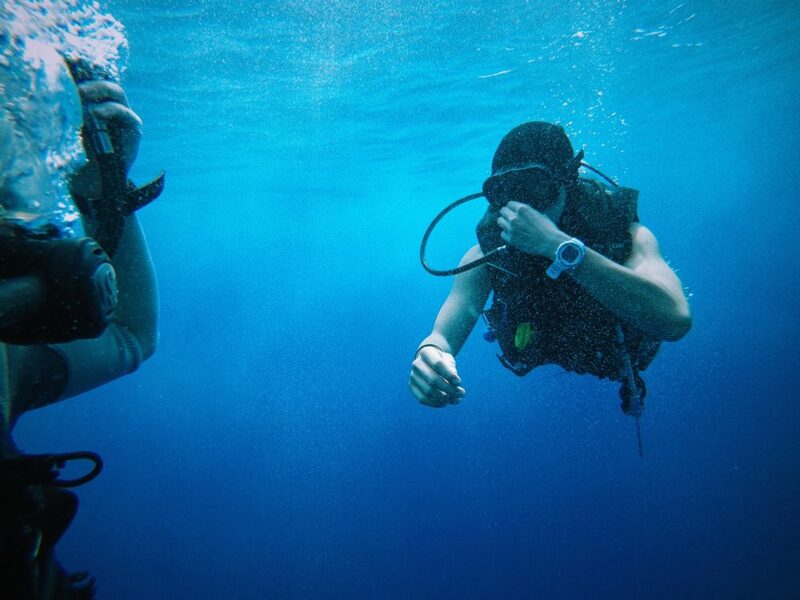 Scuba divers will find plenty of dive shops along the coast of Santorini. The Nea Kameni crater is a popular destination, or nearby wreck sites. You may not find the mind-blowing coral of the Great Barrier Reef or the Caribbean seas, but divers will enjoy a peek underwater at Santorini. 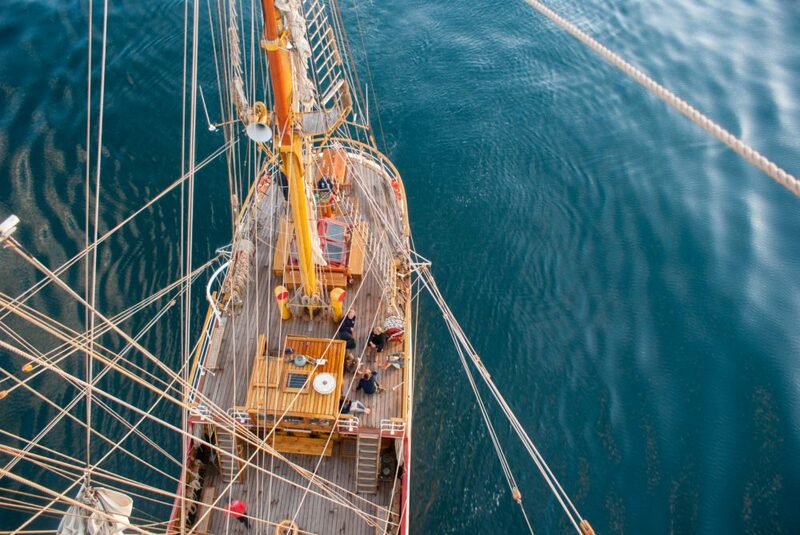 If you prefer to stay above water, there are plenty of sailing charters and yacht excursions from Santorini. You can join a sunset cruise on a catamaran, a full-day caldera cruise, or an afternoon BBQ cruise to a scenic lagoon. Of course, Greece is a popular cruise ship destination, so you may want to book an overnight cruise and watch the sun rise over the Mediterranean. Whatever your choice, be sure to get out on the water at some point in your visit to Santorini. A unique option for your stay in Santorini is to stay in a cave hotel. 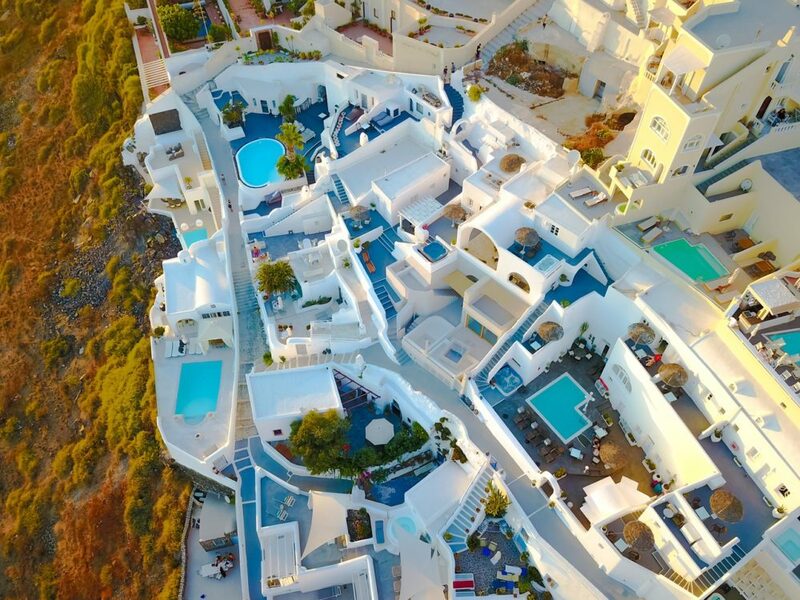 Cave hotels are especially popular in Oia and are an Instagrammers dream. Carved directly into the cliffside, the caves hold sleeping rooms or entire homes looking out at the blue sea. Other hotels will have a cave pool for guests to explore. Some “cave hotels” offer traditional rooms and cave rooms, so double check your booking to ensure you get the kind of room you want. Of course, any Greek vacation will feature amazing Mediterranean cuisine. Long touted as one of the heart-healthiest diets, a Mediterranean diet of fresh seafood is readily available on Santorini. You can take a food tour, for an expert overview of the local cuisines, or just explore on your own. 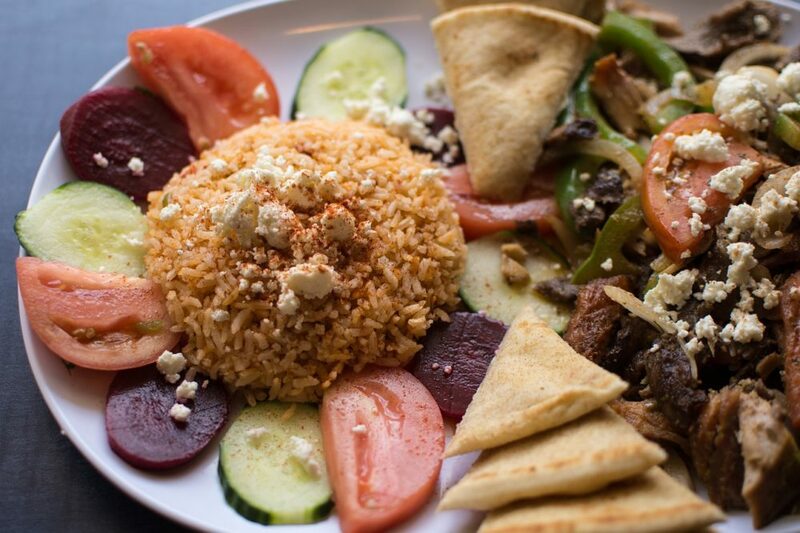 In addition to seafood, fava is a popular local dish, as well as the usual Greek favorites like Spanakopita, Moussaka, lamb and Saganaki.